It's an average film, packing some good Grace-Harty laughs while other gags fall off the mark. 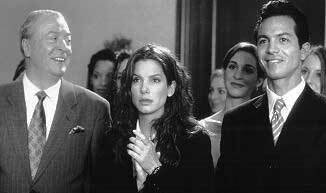 The most difficult to swallow being the film's premise that Sandra Bullock (as FBI agent Grace Hart) should somehow be unattractive without lipstick and nail polish. Tomboy Grace Hart must go undercover as Miss New Jersey in the Miss United States beauty pageant (oh, sorry, make that "Scholarship pageant"). She's one tough lady sincerely unaccustomed to manicures and high heels. Therein lies the film's strongest hits - rugged Bullock trying to look sweet, elegant and giddy - all the while gritting her teeth in disdain. Unfortunately, some of the punch relies on our believing that Bullock isn't already beautiful. Such a presupposition leaves audiences feeling a tad insulted. After a fine opening sequence the film moves quickly into a cheesy detective bust scene, compromising the momentum. Though it seems to be a cop movie, "Miss Congeniality" is essentially a "Cinderella" comedy. Since the slim climax relies on FBI plotting, it's authority wanes for lack of substantive action. Still, Bullock and Michael Caine (as the beauty expert in charge of "transforming" this hardened agent into a queen) are marvelously charming, clever and fun together. Some of the dialogue here takes the crown. Benjamin Bratt performs respectively. You'll also enjoy Candice Bergen and William Shatner as the co-hosts of the pageant. Miss Congeniality. Copyright © 2000. Starring Sandra Bullock, Michael Caine, Benjamin Bratt, Candice Bergen, William Shatner, Melissa De Sousa. Written by Marc Lawrence, Katie Ford, Caryn Lucas. Produced by Katie Ford and Sandra Bullock at(C)2000. Rated PG.